On August 29th, Monday, Guest Artist Wood Sculptor/Jeweler and sweets enthusiast Julia Harrison, did a mini-residency at TPR, sharing with me some techniques to carve wood shoes! Then later that evening we had a long conversation about where she comes from (which seems to always tie very closely to why people make things), and the connections between her work as a maker and her studies in anthropology and conservation. I look forward to going back over our talk and creating a Solstenen Guest Artist Profile. 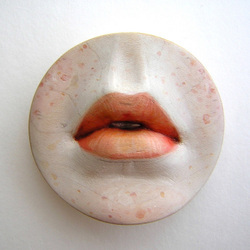 When I began working with the idea of ‘A Stone Woman’ in mind for inspiration…a jumping off point, my mind went to Julia Harrison‘s incredibly detailed life-like carvings of elements of women’s bodies (and an assortment of other recurring forms that seem to have a connecting thread, a Julia-logic of sensuality). She seems to do the opposite of my heroine in the A.S. Byatt story, rather than flesh turning into natural materials, Julia seemingly reveals flesh below the surfaces of wood…revealing a wood woman. I am also drawn to Julia’s work because my roots for being an artist grow out of craft, namely the notion of craft objects having an intimate relationship with both maker and user, such as the engagement between lips and edges of ceramic tea bowls. The sterility of art objects in cases or pedestals, or white walls has never been a part of my life, at least not by choice. Julia’s work is worn and warmed by the body, experienced through touch just as clothes and fabric are. I feel shameless lust when I see the things she makes. She is an insightful wit, eager to push her work into unknown territory through research, travel and writing, and share what she knows through teaching. She also delves into our complex relationship to ingesting beautiful things, and has researched into the history of the Kashigata, a Japanese sugar mold, as well as writing about her own obsession with unusual treats. Hearing Julia talk about how she strings all of this together (carefully and with great attention and skill…like her carved wood chain) was fascinating and gave me a deeper understanding of her work! I’m also really chomping at the bit to go get a set of carving tools, find some green Alder wood and try my hand at carving wood! InSolstenen, Why Do We Make Things?